Participate in small-group online knowledge discovery sessions, scheduled every alternate Saturday. 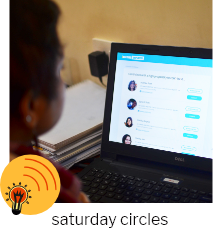 Sign up to get information on the next upcoming Saturday circle. Join a mid-week reflection session, where we engage with the single Micro Book and share our insights and learnings. Typically held on a Thursday late afternoon, these sessions are meant to help us create a space of reflection in the midst of our busy world of action. Learn new ideas and new ways to think in a systematic manner, byte-by-byte, delivered to your mobile phone. Powered with Illumine’s unique deep learning and assimilation architectures, these Micro Courses are specially designed for easy learning at your own pace.